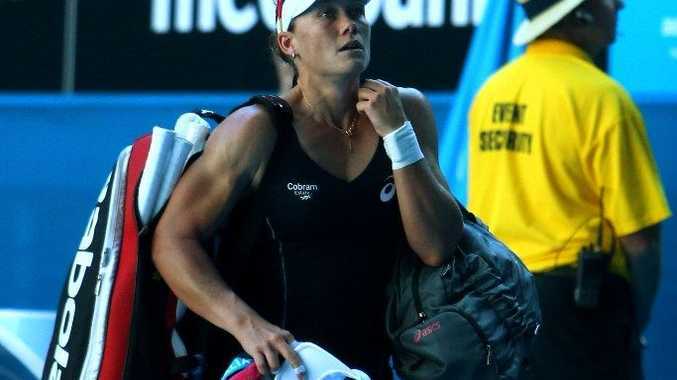 LEADING Aussie player Sam Stosur has been unable to repeat her Fed Cup heroics, beaten 6-4 6-4 in the first round of the Grand Prix tournament in Stuttgart by former world No.1 Jelena Jenkovic. The Serb, who won in Stuttgart in 2008, broke Stosur's serve in the ninth game of the first set and the third game of the second. Seeded six, Stosur said it had been tough backing up after last weekend's drawn-out Fed Cup tie against Switzerland, but added, "that's not an excuse". It was Jankovic's first win against a top 10 world-ranked player in more than a year, the last success also coming against Stosur 14 months ago in Dubai. Meanwhile Bernard Tomic has been sent packing from the Barcelona Open, the Aussie beaten 6-0 6-2 in the second round in just 48 minutes by Argentine Juan Monaco. The upset of the day saw top seed David Ferrer beaten 7-5 3-6 6-1 by Russian qualifier Dmitry Tursunov. Ferrer's loss make Rafael Nadal's task of winning the tournament for the eighth time easier. The Spaniard beat Argentine Carlos Berlocq 6-4 6-2 and was due to play Frenchman Benoit Paire overnight.